Summary: Publishing open government data dissipates the mist around the administration and enables a healthy dialogue between the giant state octopus and the small fishes. This is called transparency. This article is written with the digital ink of my passion for open data. It has grown exponentially since the moment I was convinced that it was a fantastic tool to bridge the gap between citizens and their leaders. I think the growing lack of trust comes from the feeling that, although most of our leaders have been directly or indirectly nominated with our votes, many decisions are taken behind our back. And if they are taken behind our back, it must be because they do things they don’t want us to know, right? This lack of trust led 1) citizens to progressively take distance from the politic life, 2) and the politics to assume the great majority of the electors doesn’t care much about what’s going on at the different decision levels of the State (local, regional, national). You end up with a dialogue that is greatly flawed due to the lack of information shared by all parties, and tensions rise. Increasing the quantity and the quality of the information describing what is happening in the country and in the administration is the foundation of a healthy dialogue. The United States, the United Kingdom and France are among the countries that lead the pack. To illustrate the problem and its solution, let’s use fresh events that take place in France. On September 20th 2014, the French Ministry of Budget published the distribution of the budget allocated to MPs (en) to subsidize municipalities and associations in their district for 2013. Until then, only the global amount and the amount per region was published. Now, not only do we know how much each MP granted, but we also know the names of the municipalities and associations who benefited from the grants. The press and associations of citizens analysed (here (en) or here (en)) this information and potential conflicts of interest were highlighted. I assume the MPs will be more careful as the citizens can now watch where the public money goes. On the other hand, wise subsidies are likely to boost the popularity of the MPs who grant them. Or this grant system might simply be deleted as it can be considered as a violation of the separation of powers, as the PMs (legislature) technically replace the municipality, the department and the region (executive) when they fund local associations. In any case, the publication of the dataset is the foundation of an healthy dialogue, based on shared indisputable facts. Open government data is like publishing the details of the subsidies granted by the MPs, but at the scale of a country, region or city: making the elected representatives accountable for their actions and giving the citizens the information to base their judgement, and potentially their vote, on facts. Summary: The administrations are sometimes reluctant to spend resources in open data publications as the return on investment is not obvious. In spite of the lack of maturity of the commercial usage of open data, the transparency, thus the public debate, have quickly benefited from these publications. I think the core value of the data is created when it’s manipulated in a way that unveils new insights that support decisions. And the more you cross datasets, the better the chances to do unprecedented findings. With the boom of open data, discussions arose around the following question: what is the value of open data? This question is relevant at a time when ministries and other administrations are asked to publish quality data for free. Transparency is noble, but it doesn’t pay the salary of a data specialist who will ensure the published data is consistent and free of confidential or personal information. Time will tell, but I believe that when manipulating open data, value is created when the analysis unveils brand new insights that lead to better decisions. Although the analysis of a single dataset can be valuable, the most valuable data analyses and visualizations are those that cross various datasets together. This is because, by nature, a dataset has a limited scope. Publishing a dataset with a specific scope is good, because it makes its purpose easy to identify. However, crossing this data with more data about the MP enables a deeper analysis and above all, has great chances to unveil insights that had never been discovered in the past as the two datasets were managed and used in isolation. it bridges the gap between different pieces of information that compose the whole public information about MPs, saving time for future research. The added value is not easy to measure in financial terms, especially so soon after the publication of the data. Moreover, the consumption of data published by the government is not common practice yet. Summary: If data crossing favours the discovery of new insights, it should be made easier: nowadays, locating government datasets that can be crossed is cumbersome, in spite of the deployment of faceted search engines. The problem is that the current metadata about the datasets is too superficial. The initiative of enriching the data published by the government is noble, but this aggregation of datasets could be made easier. Technically, enriching a dataset means adding extra columns of data from dataset 1 that describe a subject present in dataset 2. In database terms, this subject, it’s a foreign key, an identifier that is available in two different datasets and that refers to the same thing. When a new dataset is published on most open data portals, some metadata is also published, such as the date of publication, the administration that publishes the data, or its domain (health, elections, etc.). This metadata enables the creation of faceted search engines (data.gouv.fr, data.gouv.uk) that help performing accurate search among the numerous datasets. However, no metadata indicates what columns the dataset contains. The datasets are not linked together. We have datasets that describe the same things, but that don’t “know” about each other. There is a solution to create metadata that actually connects the dataset together: describing their content with machine-readable semantics. Summary: To improve the search of datasets, the Semantic Web technologies bring a graph data model, a worldwide identification system and semantics. In this section I show how it could boost dataset crossing with a practical example. Machine-readable: something that a machine can interpret in order to perform the relevant actions. Semantics: meaning, the act of defining what something is. What we need to boost our open data search is to associate meaning to the data contained in the datasets. Meaning appears when concepts are connected together with meaningful relationships. Great, the W3C has a standard to express semantics: the Resource Description Framework. A version of this graph in Turtle notation can be downloaded here. 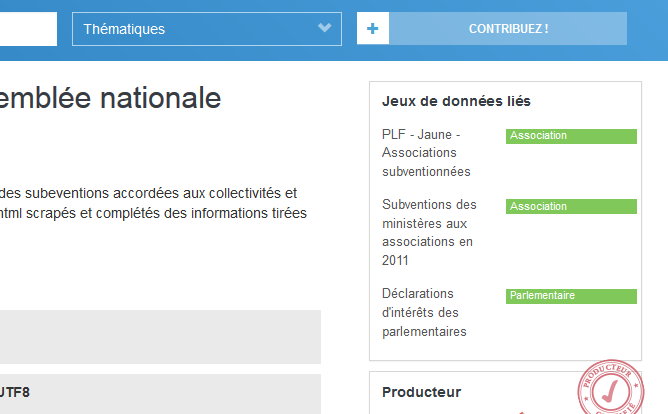 If the datasets stored on data.gouv.fr were all tagged semantically and I wanted to add more information about the associations listed in the MPs grant dataset, I would look for all the datasets that have a column that lists formal organizations. The search results would tell me that besides the dataset I already knew about, two more datasets have a column listing formal organizations, and are consequently good candidates for data enrichment. Yes, but unless you also use URIs to identify things, the scope of your identifiers will be no bigger than your database. With RDF, the scope is the World Wide Web. With a bit of tweaking, if other open data portals use the same vocabularies, I could query them all in a single shot. SQL performs well, but it lacks standardization across vendors and it’s limited to a tabular (bi-dimensional) data model. When high-availability is required, combining an RDF/SPARQL stack for expressiveness with a NoSQL stack for performance brings the benefits of the two worlds. If we want to tag the columns, we need to build a reference dictionary of the things that are described in the data at the scale of the country. The purpose is similar to the creation of a controlled vocabulary. The column above is interesting because it has a common characteristic: it lists things that are not strictly homogeneous in their nature. The sample data show two MPs and a collective fund where MPs can deposit a part of their budget. The column consequently contains things that are part of the French Parliament and have the power to issue grants. These things can either be MPs (persons) or collective funds to which MPs contribute (organizations). The RDF graph of a column. The types (= classes) of things are in purple, the things (instances of classes) are in yellow. The column object, in the middle, contains things of two types: MP and ParliamentaryCollectiveFund . In order to link them with standard vocabularies, I have respectively declared them sub-classes of the classes foaf:Person and foaf:Organization from the FOAF vocabulary. Via the data:hasProperty property, I have added that, in this column, each cell contains the name (foaf:name) of the MP or ParliamentaryCollectiveFund. Otherwise, looking at the RDF, we would only know what sort of thing the column describe, not what each cell contains: is that their birth date? their Web site? their role? Adding data:hasProperty and foaf:name, we know that the cells of this column contain the names of instances of MP and ParliamentaryCollectiveFund. More important, with the right search interface, visitors could find this dataset if they are looking for datasets that mention the names of MPs or parliamentary collective funds. Or even, more generically, the names of persons or organizations. For the types that miss a definition (usually the most specific ones), the best approach is to ask the publisher of the data to provide it. 1. A query asks the data: among our previously tagged columns, find me all those that have a ?label (the header text) that contains “parlementaire” (the header text of the column we want to tag in the new dataset). For each matching ?column, return the ?definition(s) of the ?type(s) of things it describes and the ?propertyLabel of the ?property that it corresponds to. A model of the corresponding SPARQL query and the results. 2. If similar columns are found, their ?definitions are suggested to the publisher, and the publisher picks the one that matches for the column in the data they are publishing (“What type of thing does the column describe?”). If none matches, either they select “I don’t know” if they don’t know what type of things the column describes, or they enter a definition that is added to the dictionary. “We have detected the following columns. What is their meaning?”. The contributor either picks a definition in the list or select Other and writes a new one. 3. If the publisher found a relevant ?definition, they are also prompted to pick a ?property among those that apply to the ?type they selected via the ?definition. For instance if they select the ?definition of the ?type MP, they can pick “Name” (the ?propertyLabel of the ?property foaf:name). 4. They repeat for each column, and publish the dataset. This procedure is a little intimidating and must be improved for an optimal user experience. But you get the idea. The publisher should be informed of the benefits of this tagging for the reuse of their dataset. Once the dataset is published the columns that are not linked to a type are taken care of in a dedicated process. Why would we need to search for a dataset that could be crossed? Why not having a side panel on each dataset page listing the best candidate datasets for enrichment? In this article I only highlight the potential benefits of the Semantic Web technologies to stimulate data crossing and create more insightful datasets, thus more value! The next step is to make a prototype. Which ministers have never been elected and were born in a department that exported more wine than meat in 2012? What was the abstention rate for the last presidential elections of the cities that had an unemployment rate greater than 12 %? If you have any question or remark, please kickstart a conversation below or email me, I’d love to have your feedback!